The Enterprise Quartet is a university-based ensemble featuring members of the Department of Music and the Edmonton Symphony Orchestra. This project involves research and community development, with the particular objective of enlivening Edmonton’s cultural landscape with high-quality chamber music performances featuring Edmonton’s own wealth of local talent. Guillaume Tardif (Doctor of Musical Art, Eastman School, University of Rochester) is Associate Professor and Area Coordinator for Chamber Music and Strings at the Department of Music, University of Alberta. He is an active concert violinist, performing in Canada and abroad as soloist and chamber musician – recently at Carnegie Hall in Paganini’s 24 Caprices. His research also takes the form of recording productions and violin compositions. 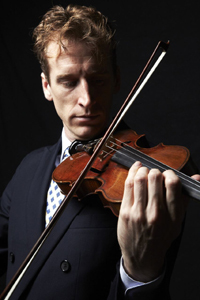 His main areas of teaching are violin, chamber music, string literature and string pedagogy. He also teaches for the Kule Institute and the School of Business (‘Culture and Creativity from the Music and Business Perspectives’). In the summer of 2012, he was a guest professor at the University of Innsbruck (Austria) and at two international music festivals in Italy and the US. Among other ongoing projects, he is president of the Alberta String Association and leads the Enterprise String Quartet project (for which he was nominated for a TELUS Courage to Innovate Award, City of Edmonton). In recent years, he was the recipient of many grants from various agencies, such as Killam, Skarin, Edmonton Community Foundation, and Alberta Foundation for the Arts. Yue Deng was born in Hebei, China. At the age of eight, she won First Prize in the National Violin Competition in China. She received her B.M. from the Oberlin Conservatory, and her M.M. from the Juilliard School. She attended the Music Academy of the West, studying under Zvi Zeitlin, then played concerts at Carnegie Hall with the New York String Seminar Orchestra. In 2003, she performed with Roger Kellaway and Bill Charlap at Birdland. Gene Lees wrote an essay about her in his book “Friends Along the Way”, which was published by Yale University Press. She was the concertmaster and soloist for the Henry Mancini Institute in 2002 and 2003. Roger Kellaway arranged and wrote an album for her “Both Sides Now”. In 2006, she was the featured soloist in the tribute concert for John Williams and Ginny Mancini at Kodak theater. As a recording artist, she has recorded with Barbra Streisand, Barry Manilow, Diana Krall, Josh Groban, Johnny Mandel, Willy Nelson and Dionne Warwick, and on movie scores such as Invictus (2009) and In Her Sleep (2008). Her album with Jean-Yves Thibaudet titled “Ogermann: Violin and Piano works” was released on Decca in 2007. 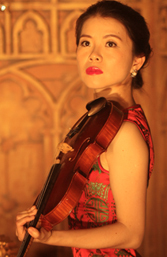 In 2013, Yue Deng joined the string faculty at the Department of Music, University of Alberta. 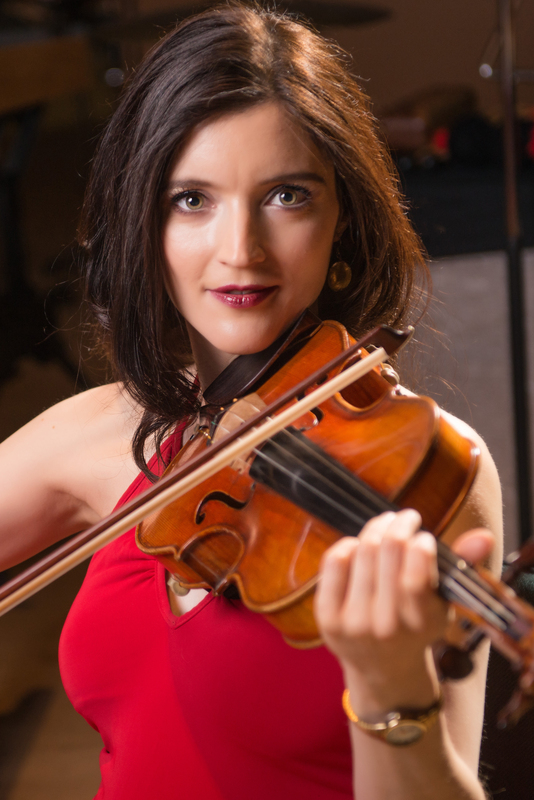 Born in Montréal, Virginie Gagné started to play the violin at age three and entered the Montréal Conservatory of Music at eight, where she later received the Bachelor degree with honours both in violin and chamber music. She pursued her Master of music studies at Rice University in Houston, Texas with violin teacher Sergiu Luca. Virginie has received several prizes in violin at the Montréal Symphony Orchestra Competition, the Canadian Music Competition and the Canada New Music Competition, among others. Her orchestral experience includes concerts with Les Violons du Roy, I Musici de Montréal, the Houston Symphony Orchestra, and a one-year position, section first violin, with the Honolulu Symphony Orchestra. She was named to the First Violins of the Edmonton Symphony Orchestra following auditions in April, 2006. Virginie currently serves as Assistant Concertmaster (on leave) at the Edmonton Symphony Orchestra. Born in South Korea, Kyung rok Moon began violin and piano lessons at the age of seven. 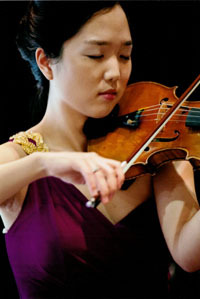 Her past orchestral experience includes performances with the Busan Symphony Orchestra (South Korea), University of Virginia Orchestra and Mannes College of Music Orchestra. Recently, Kyung rok Moon has been the recipient of several distinctions, including the Beryl Barns Memorial Scholarship, Queen Elizabeth II Scholarship, and Kathy Hogan Memorial Scholarships. She has also attended several festivals at home and abroad, including the Salt Spring Chamber Music Festival (Canada), Schlern International Music Festaval (Italy) and Shanghai Music Festivals (China). She is currently studying at the University of Alberta, working towards a Masters of Music in Violin Performance with Professor Guillaume Tardif. Clayton Leung is devoted to enticing youth to learn and appreciate orchestral music and the wide array of musical styles orchestral instruments are capable of playing. His interest in exposing youth to classical music stemmed from his work at the Courtenay Youth Music Centre, Langley Community Music School, and the Cleveland Institute of Music Preparatory Department’s Distance Learning and Community Outreach Programs. Clayton and four of his colleagues from the Newfoundland Symphony Orchestra toured western Newfoundland and northern Labrador bringing classical music to youth and adults in isolated communities, who would normally not have the opportunity to hear live classical music. Born and raised in Vancouver, Mr.Leung was immersed in music since the age of three. His formal training began at the Langley Community Music School and continued at the University of Victoria and the Cleveland Institute of Music. He has studied under Lucia Shipperus, Heilwig von Koenigslow, Sharon Stanis and Robert Vernon [www.edmontonsymphony.com]. 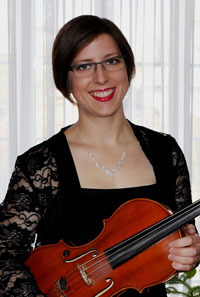 Jeanette is the Principal Violist of The Alberta Baroque Ensemble, having been a member of the ensemble since 2011. Jeanette performs regularly with the Edmonton Symphony Orchestra and also enjoys performing chamber and solo music. As a soloist, Jeanette performed Telemann’s Concerto for Two Violas in G Major with The Alberta Baroque Ensemble in February, 2015. Jeanette also performed Telemann’s Concerto in E Major for Flute, Oboe D’Amore and Viola with The Alberta Baroque Ensemble in 2014. Jeanette performed the Viola Solo in a performance of Harold in Italy by Hector Berlioz with the Concordia Symphony Orchestra in 2011. Jeanette enjoys teaching Viola, Violin, Piano and Theory, and is a founding member of Bel Suono String Quartet. A native of Edmonton, Leanne is active as a chamber musician, orchestral player, soloist, and teacher. Recent projects include touring Europe with the Obsessions Octet, Bicycle Symphony at the Kaleido Festival, a recital on the Holy Trinity Concert Series, alt-folk band Dead Red Pine, and organizing Phil Kline’s Unsilent Night. 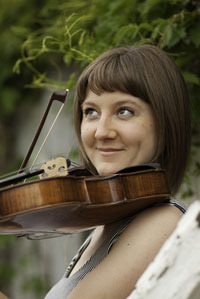 She has also played with the Edmonton Symphony, Alberta Baroque Ensemble, Enterprise Quartet, and at the Citadel Theatre. Leanne teaches at Alberta College Conservatory, Society for Talent Education, and the Conservatory of Music at Taylor College. She has music degrees from the University of Alberta and the Eastman School of Music, and an Artist Diploma from McGill University. Colin Ryan graduated from McGill University in Montréal and continued his studies in the United States and in Europe. He was the Principal Cellist of the New Chamber Orchestra of Canada in Toronto before joining the Edmonton Symphony Orchestra in the same capacity. Colin remained in this role for some 39 years, from 1976 to his retirement in 2014. He has also performed with the Orford String Quartet, the Pacific Baroque Orchestra in Vancouver and the World Philharmonic Orchestra, an orchestra comprised exclusively of principal players of orchestras from around the world. He has appeared as soloist with the Edmonton Symphony, the Alberta Baroque Ensemble, and other chamber orchestras in Edmonton. Colin was invited to join the National Arts Centre Orchestra for a summer season as Guest Principal Cellist and also plays baroque cello and viola da gamba. He also plays bagpipes and marches with the RCMP Regimental Pipes and Drums. In 2013, Colin joined the string faculty at the Department of Music, University of Alberta. 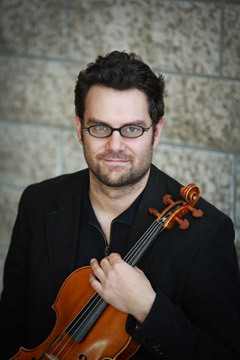 Violist and violinist Charles Pilon studied with Sonia Jeinkova at Montréal’s Marianapolis College. 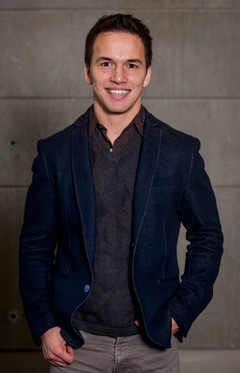 He earned a Bachelor of Music from McGill University under Mauricio Fuks before further studies at the University of Southern California’s Advanced Studies program with Robert Lipett. During his time at USC, he also studied with David Cerone at the Encore School of Strings and Roman Totenberg at Kneizel Hall. His viola mentors are former ESO Principal Viola Nick Pulos, and pedagogue Thomas Riebel at the Salzburg Mozarteum. Mr. Pilon has played for CBC Young Artists in Concert, and joined Orchestra London (Ontario) in the First Violin section (2003/04) before joining the Edmonton Symphony’s First Violins for the 2004/05 season. He successfully auditioned as Assistant Principal Viola of the ESO for the start of the 2005/06 season. 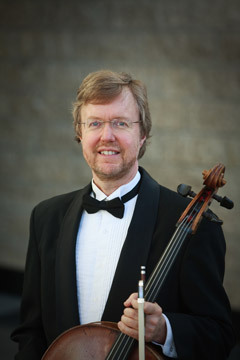 Since his arrival in Edmonton, he has been active in the local music scene, including performing as a soloist with the Alberta Baroque Ensemble. Mr. Pilon has received grants from the Québec Council of the Arts, and the Alberta Arts Foundation. Charles now serves with the Orchestre symphonique de Montréal. Born in Melbourne Australia, Tanya Prochazka studied at the Paris Conservatoire with Andre Navarra and in Bloomington, Indiana with Janos Starker, following which she has pursued a career of international performance and teaching. Ms. Prochazka moved to Edmonton from London, England with her family in 1986. 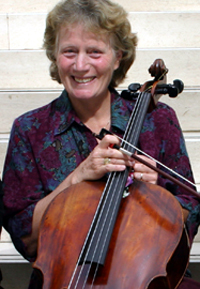 She became Professor of Cello and Conductor of the University Symphony and Academy Strings Orchestras at the University of Alberta in 1998 and since 2009 was Professor Emerita. One of Canada’s leading cellists, Ms. Prochazka performed repertoire from the Baroque to the present day. Highlights of her career included a Carnegie Hall recital, world premiere performances of concertos by Alfred Fisher and Malcolm Forsyth, performing string quartets in the natural concert halls of the Grand Canyon, leading a tour of Cuba with the Academy Strings Orchestra and performing all the works of Brahms for cello and piano (including transcriptions of his clarinet sonatas). Her CDs include the world premiere recording of the New Goldberg Variations with pianist Jacques Despres as well as several recordings with pianists Stephane Lemelin, Milton Schlosser, Sylvia Shadick Taylor and Janet Scott Hoyt. Tanya conducted the main symphonic repertoire as well as opera and large choral and orchestral works. Tanya passed away on May 12, 2015. She is greatly missed by the Quartet.